(Nanowerk News) It seems that reality is catching up with science fiction fast. On TV, the latest Knight Rider series features a car that embraces nanotechnology to change colors and morph into similar car forms temporarily. 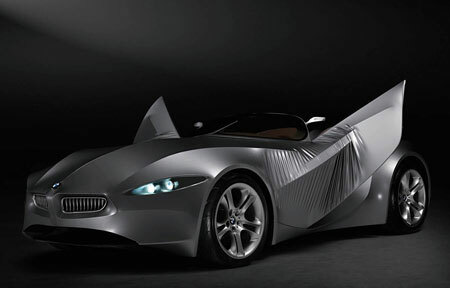 Yesterday, BMW introduced it's "GINA Light Visionary Model". The car has a flexible outer skin, making some elements of the substructure moveable. The GINA Light Visionary Model takes the sculptural design that has already been established by a number of production cars to a new, unparalleled conclusion. The car’s front and sides, including the doors, create one single uninterrupted, seamless whole that converges to form an optical as well as a structural unit. It would be interesting to know if and what kind of nanotechnology materials and processes would be involved in building the car's flexible skin.